The first wearable camera that can fly. 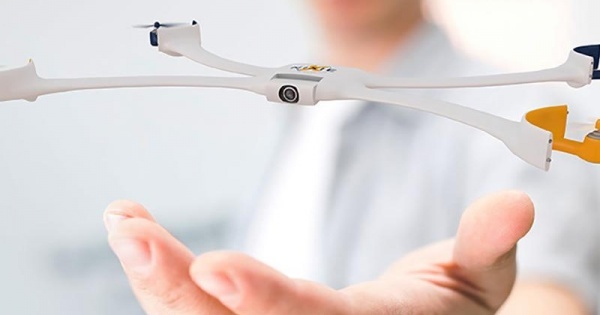 The Nixie is a tiny wearable camera that can transform from a wrist band into a quad copter that flies, takes photos or video and then returns to you. The project is a submission to Intel's Make it Wearable contest aimed to promote the use of the Edison platform - while in the protoytyping stage the idea was enough to score a $50,000 finalist prize. Oh man, this would make a great picture. I wish there was someone else here to take our picture for us. The Nixie aims to solve that - a flying wrist band with a camera built in. When you’re ready for your close-up, it launches off your wrist, reorients to frame you in the shot, and then hovers back over for you to catch it and place back on your wrist. Unfortunately it is far from complete so the vain are going to have to wait a while for this. It will be interesting to see the warning label that comes with it - just imagine hanging of the side of a cliff, use the camera and as you attempt to catch it on its way back you end up falling off. A class action suit may not be an issue if they are high up enough.